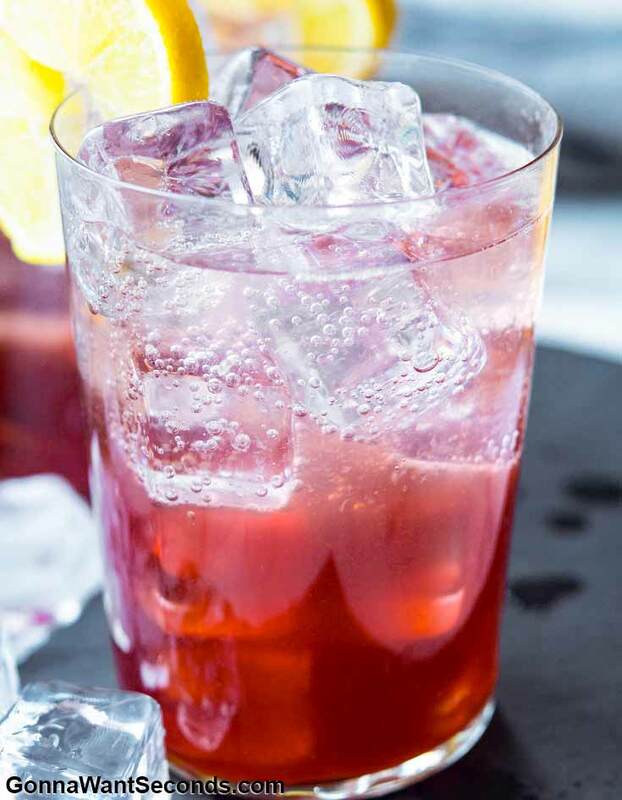 Light and bubbly, fun and fruity, Sloe Gin Fizz is a great party or even a just-because drink. Shake up a cooler in two minutes flat! Sloe Gin Fizz is a year-round joy. The holidays, summertime, anytime, so mark this page for later! Its low maintenance instructions and gorgeous presentation make it a welcome friend any season. The color is a subtle pink that is accentuated by the bright cherry and lemon wheel garnish. The flavor is sweet and tangy, smooth and crisp, with notes of berries and botanicals, and a citrusy finish. I assure you your guests will not be “sloe” to imbibe! And you’ll never see “sloe” move this fast again! In case you are wondering, Sloe Gin Fizz is strong enough to get the party started, but not so strong that you wish it hadn’t! If the Fizz has given you a taste for citrus mixology, and you have a couple more adult parties on your calendar this season, check out my recipes for Creamsicle Drink, Planters Punch, Apple Pie Moonshine and Hippie Juice are a few other deliciously fruity options. It is so so easy to make! Sloe gin drinks are wonderfully fruity and mild. They produce such a pretty delicate pink hue in the glass. 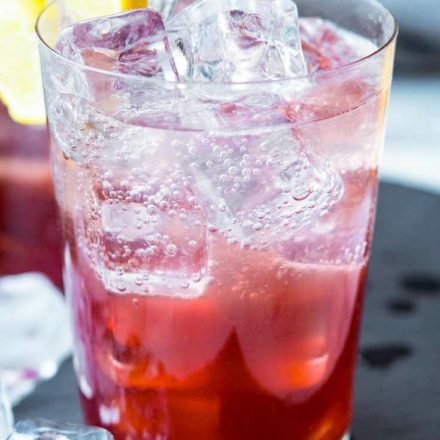 What Is A Sloe Gin Fizz? While sloe gin fizz history is rich and intriguing, the drink itself is simple as can be! A refreshing fizzy highball, the cocktail is made with just four ingredients. The beverage was invented in our mother country across the pond, where a queen reigns and sloe berries blanket the hedgerows. 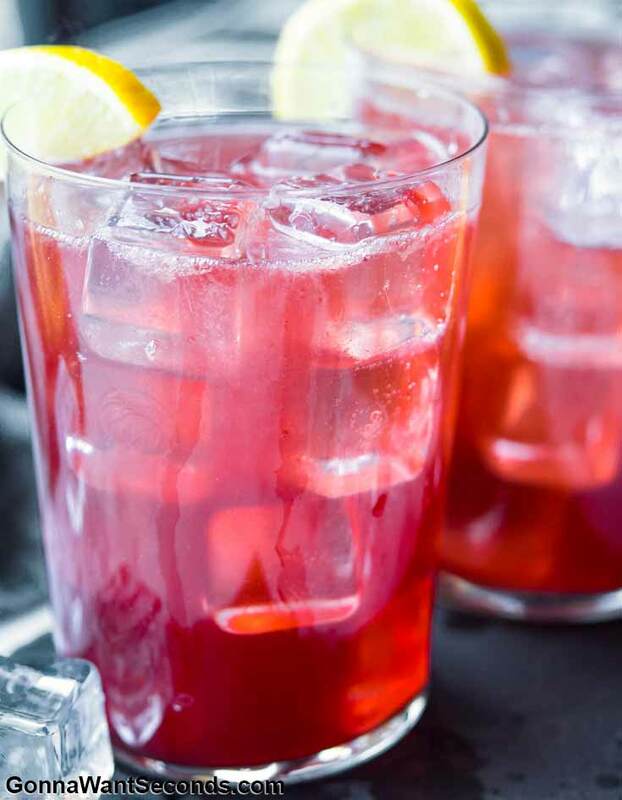 In its heyday, Sloe Gin Fizz was considered a “morning drink” or hangover cure. It went out of style due to a dearth of quality sloe gin, and now like Britannia’s independence, it is once again on the rise! 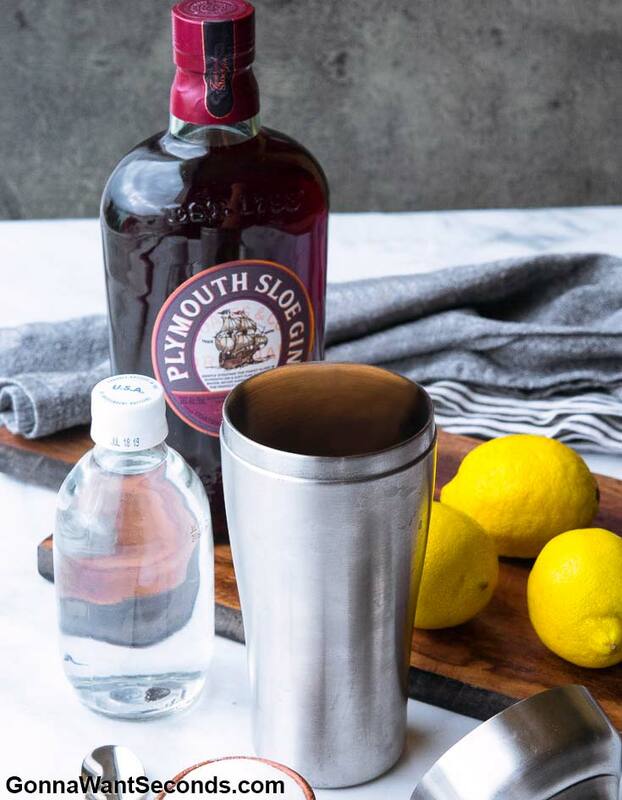 What Ingredients Do You Need To Make Sloe Gin Fizz? 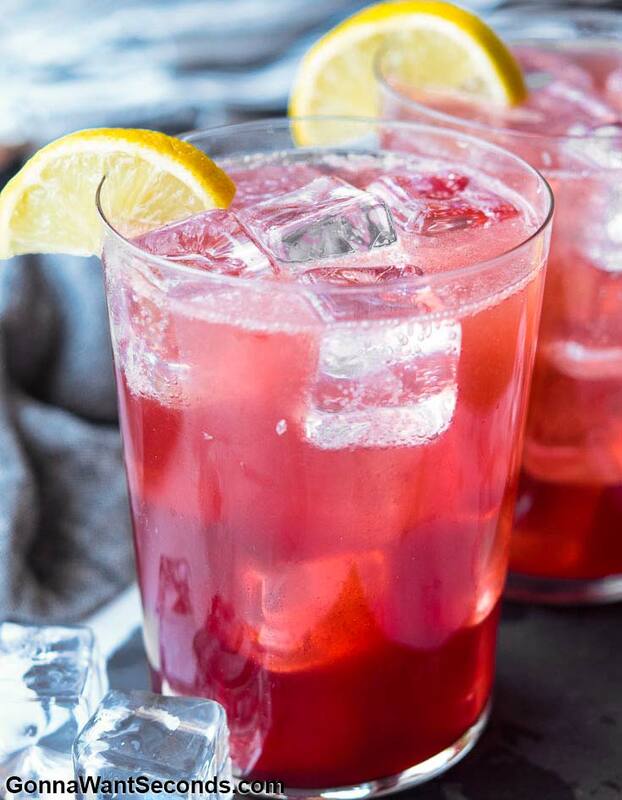 This delightful drink gets its flavor from sloe gin, fresh lemon juice, and a bit of superfine sugar. Club soda gives it that bubbly pizazz, and lemon wheels and cherry provide the finishing flourish. My Sloe Gin Fizz recipe is incredibly stress-free. Everything but the garnish and soda gets mixed in the cocktail shaker then strained into your highball glasses. Then you just stir in the club soda, garnish, and serve! The simplicity of this cocktail makes it an excellent choice for the tired end of an evening or long event. What may be best of all: you get to show off your mad cocktail shaker skills in a low-pressure setting! 5. Fill a highball glass with ice, and strain the cocktail in the glass. Top with club soda. 6. Garnish the edge of the glass with lemon wheel and/or a cherry. Cheers! What Does A Sloe Gin Fizz Taste Like? Gin fizz ingredients create a sweet, bubbly, mild citrus taste over the strong base spirit. The sloes lend a delicate dark berry flavor (think dates and currants), and the gin adds deep botanical notes. Some people think gin tastes like Christmas trees! Overall, Slow Gin Fizz is a subdued fruity drink with a hint of sour tang. Add all the cocktail ingredients, except the club soda to a Cocktail Shaker filled with ice and shake well. Fill a highball glass with ice then strain cocktail in the glass. Top with club soda and stir. Garnish the edge of the glass with the lemon wheel and top the cocktail with a cherry. Enjoy! What is superfine sugar: Superfine sugar, also called caster sugar, is granulated white sugar that has been ground down to even smaller particles. It is a favorite of bakers because it more easily dissolves and creams! It works well in sloe gin cocktails for the same reason. To make superfine sugar yourself, put regular granulated sugar in the food processor, and turn it on high for a couple minutes. Powdered sugar: Ma’am, step away from the solid sugar alternatives! Sloe Gin Fizz with powdered sugar is a no-no. Powdered sugar contains cornstarch, and thus can mess with the flavor and texture of a cocktail. For best results, stick to a granulated option, or try Sloe Gin Fizz with grenadine. Just add a teaspoon of the syrup in place of the superfine sugar! Fresh lemon juice: Store bought lemon juice is sure a time saver, but sometimes the flavor doesn’t quite measure up to the freshly squeezed variety. Here is a quick lemon hack if you plan to squeeze your own: cut the lemon lengthwise for maximum juice production! Cutting lemon wheels: For the perfect half wheel, pick a ripe lemon that’s a little squishy when you pinch it, but not to the point of squashy! Then slice off the ends. Standing the lemon up on one of those ends, slice it in half lengthwise. Flip the two halves over so the pulp faces up, and give it a good slit lengthwise down the middle. This cut should go about halfway into the pulp. Flip the halves back over, and work your way down the length of the lemon, slicing small semi-circles using gentle downward pressure and a handle to tip motion. Each lemon should make about 20 half wheels. 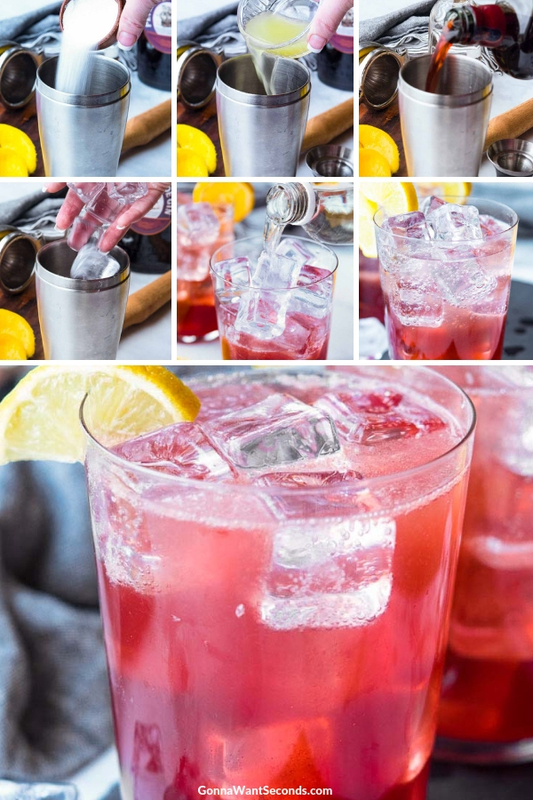 Cherry selection: All sorts of cherries are used to garnish this drink. I like fresh tart cherries, but any fresh variety — red, black, sweet, or sour –- is pretty darn good! Processed options like maraschino cherries, candied sour cherries, and brandied cherries also achieve that pop of flavor and color. As long as you steer clear of the super cheap over dyed and over syrup varieties, you really can’t go wrong. Garnish alternatives: Blackberries and oranges are two other common fruit garnishes, in case your grocer is out of lemons and cherries! Club soda alternatives: Some folks enjoy Sloe Gin Fizz prosecco style. Simply replace the club soda with your prosecco of choice, and follow the rest of the recipe as described. If you are not a fan of prosecco, champagne or another sparkling dry wine will get the job done beautifully. Word to the wise: these variations obviously up the alcohol content, so consider yourself warned! If you want to moderate your guests’ tipsiness, there’s also always sloe gin and 7UP or Sprite. You may want to halve or eliminate the superfine sugar if you go the soda route. Cocktail shaker: Using a cocktail shaker is preferable to mix the ingredients in the glass because the shaking action dissolves the sugar perfectly! If you need a Cocktail Shaker This One is my favorite!! To create your own DIY shaker in the meantime, you can fit together the mouths of two sturdy cups, or use a lidded to go cup with your thumb covering the drinking hole. Here’s a bonus pro tip: chill your high ball glasses in the freezer for a couple minutes for that extra professional touch! What is Sloe Gin? What’s The Difference Between Gin And Sloe Gin? There are three primary differences between gin and sloe gin. Firstly, gin is a liquor, while sloe gin is a liqueur. Bear with me here…. Liquor is a distilled alcoholic beverage commonly used for shots or as the base of mixed drinks. Distilling is the process of evaporating and re-condensing some liquid to remove impurities. In the case of adult beverages, distillation is used to make a fermented liquid stronger by removing some of the water content! Now a liqueur is simply a liquor sweetened with herbs, spices, flavors, and other extracts. Sloe gin liqueur is made by soaking a certain type of berry in gin and sugar. Liqueurs generally have lower alcohol content, and they are used for sipping or flavoring. The second difference is that sloe gin is made from sloe berries, while gin is flavored with juniper berries. A sloe berry, also called a blackthorn berry (or “summer’s sweetest fruit,” by the Daily Mail), comes from a plant in the rose family. A juniper “berry” is actually the fleshy seed of a species of evergreen tree called the juniper. (Note: consume juniper byproducts with care.) Gin is considered a liquor because it has a high alcohol content and isn’t sweetened. Finally, gin is clear while sloe gin is deep red. Thankfully this difference requires no further explanation! Now you have all the factoids! You didn’t know we would be compiling a sloe gin fizz wiki here did you! After you’ve mastered making a Sloe Gin Fizz, you might want to try your hand as making a Gin Fizz. Remember, because it’s made with gin (higher alcohol content) it will definitely pack more of a punch! A classic cocktail, the Ramos Gin Fizz is like a cross between a milkshake and a gin fizz. It requires a heck of a lot of shaking to create, so keep those biceps in shape so you’re ready at a moments notice to make this cocktail! 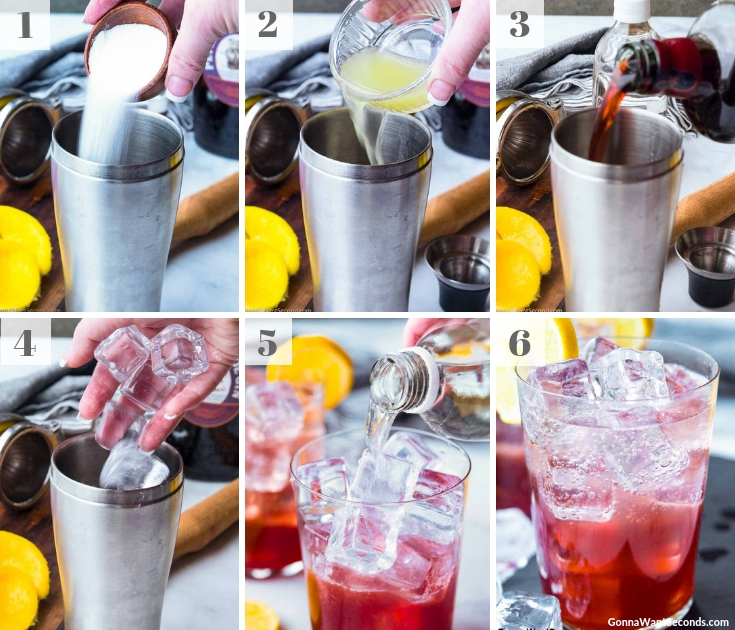 Can You Make Sloe Gin Fizz Ahead Of Time? I would not recommend making gin fizz cocktails more than about half an hour in advance. The soda will lose its fizz, and the drink will lose its chill. The good news is that the cocktail only takes a couple minutes to mix, so as long as you have the ingredients on hand, you won’t miss out on the festivities for too long! Plus cocktail shaking is a great form of entertainment. What Else Can I Mix With Sloe Gin? Sloe Gin Fizz egg white style one variation on this theme. Simply add one egg white to the recipe! Be mindful that there’s always a small risk of salmonella when you use uncooked eggs in your food and drinks, however. Other classic Sloe Gin cocktails include the Sloe Screw, Alabama Slammer, Millionaire Cocktail, Charlie Chaplin, and Flaming Homer. Think spirits, liqueurs, juices, bitters, and syrups … the options are practically endless. This may be the trickiest part of the whole recipe! Experts break down sloe gin options into two general classes: expensive and inexpensive. The less expensive brands are certainly tempting, but they have lower alcohol content, are sometimes sickly sweet, and occasionally do not even contain gin! The more expensive brands can be difficult to locate. If you opt for a lower proof sloe gin, consider replacing half of the quantity in the recipe with straight gin. Stay tuned and we will be posting new recipes for a very refreshing Gin and Ginger Ale and on the sweeter side, gin, and sprite!